Zippo regular brass lighters that have been chromed. Rugged yet refined classic brushed chrome finish is perfect for everyday use showing less finger marks than the high polish finish. 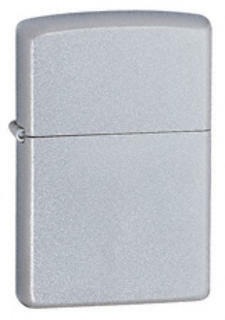 Regular profile solid brass Zippo with brushed chrome finish. Only the solid, substantial feel of a heavy walled case could enhance the feel of these Armor lighters. About 1.5 times as thick as a standard brass case, the Armor case is authenticated by a distinctive bottom stamp. Regular profile solid brass with a brushed chrome finish leaving less finger marks than a high polish finish. 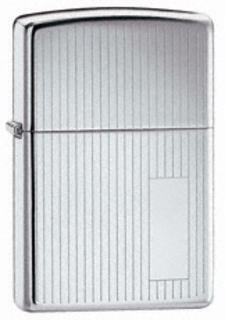 Replicating the first rounded corner Zippo in 1937 which replaced the square cornered case from 1935. 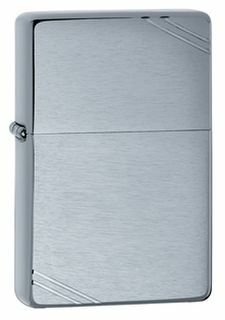 This solid brass Zippo has a brushed chrome finish and features slashes cut into the opposing corners. 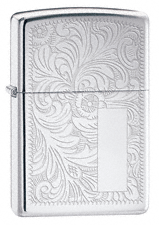 Engrave to add a personal touch to a classic high polish chrome Zippo lighter for a gift that will stand the test of time. 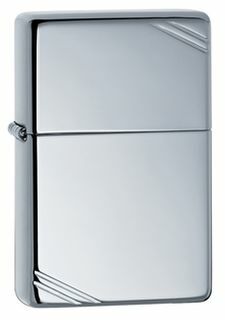 Regular profile solid brass Zippo with high polish chrome finish. 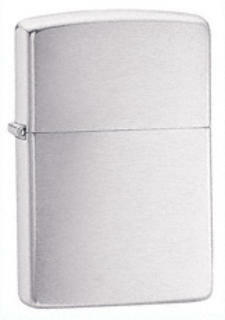 Only the solid, substantial feel of a heavy walled case could enhance feel of these Armor lighters. 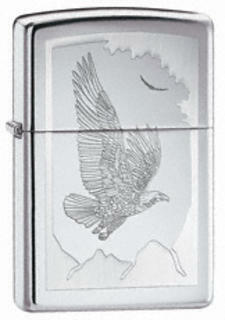 Zippo Chrome High Polish Eagle "Birds of Prey"
Regular profile solid brass Zippo with spectacular engraved/transfer soaring eagle on high polish chrome finish. Patterned - engine turned with engraving panel. 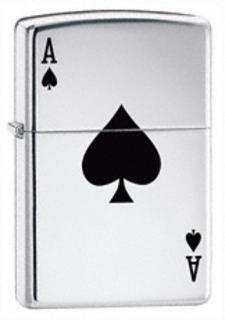 Lucky Ace Zippo for the gambler. 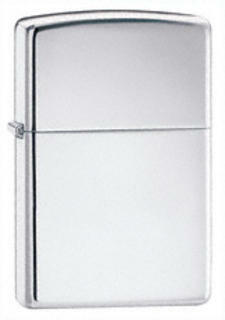 Regular profile solid brass Zippo with high polish chrome finish featuring a black Ace of Spades transfer on the front. 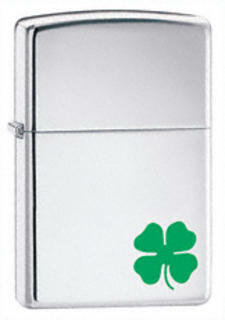 Zippo Chrome High Polish Lucky Shamrock "A Bit O' Luck"
Creative personalization makes this Zippo lighter extra special for the lucky recipient. 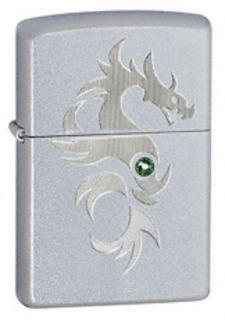 Regular profile solid brass Zippo with high polish chrome finish featuring a lucky 4-leaf shamrock clover leaf transfer on the lower right of the front. Genuine Zippo windproof lighter is packaged in a cardboard gift box with the famous Zippo lifetime guarantee. Even features a clear space plate for gift engraving on the front as shown. Genuine Zippo high polish chrome windproof lighter is packaged in a black cardboard gift box with the famous Zippo lifetime guarantee. This solid brass Zippo has a high polish chrome finish and features slashes cut into the opposing corners. 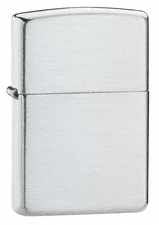 Regular profile solid brass Zippo with satin chrome finish. This bright-cut auto engraved image is accented with a single sparkling Swarovski crystal to add a touch of bling. 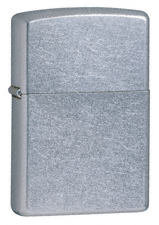 Regular profile solid brass Zippo with satin chrome finish featuring a laser-cut(?) dragon. Genuine Zippo windproof lighter packaged in a cardboard gift box with the famous Zippo lifetime guarantee. Regular profile solid brass Zippo with unusual "crazed" chrome finish.